El 13 de julio se realizará la 2a jornada de lógica, computación e información cuántica. El objetivo de las jornadas es proveer un espacio de encuentro para quienes trabajamos en fundamentos lógicos de la computación cuántica desde una perspectiva interdisciplinaria. Contaremos con charlas de Guido Bellomo (postdoctorando en el Dpto. Computación de Ciencias Exactas-UBA), Simon Perdrix (investigador CNRS en el laboratorio LORIA de Nancy, Francia) y Christian de Ronde (Investigador CONICET, Profesor UNAJ y FFyL-UBA). El encuentro se realizará en la Sede de la Universidad Nacional Arturo Jauretche desde las 10:30 hasta las 16:30 horas. Esta convocatoria que surge de jóvenes investigadores del área busca ser amplia e inclusiva. Están todos invitados a sumarse al encuentro. Se agradece la difusión. Christian de Ronde (Universidad Nacional Arturo Jauretche & CONICET) – On the physical foundation of quantum superpositions (beyond measurement outcomes and mathematical structures). Quantum superpositions are being used today in laboratories all around the world in order to create the most outstanding technological and experimental developments of the last centuries. However, while many experimentalists are showing that Schrödinger’s cats are growing fat, while it becomes more and more clear that quantum superpositions are telling us something about quantum physical reality even at the macroscopic scale, philosophers of QM in charge of analyzing and interpreting these mathematical expressions (through the many interpretations of QM that can be found in the literature) have not been capable of providing a coherent physical representation of them. In this paper we attempt to discuss the importance of providing a physical representation of quantum superpositions that goes beyond the mere reference to mathematical structures and measurement outcomes. Simon Perdrix (CNRS / LORIA, Francia) – Diagrammatic Quantum Reasoning: Completeness and Incompleteness. The ZX-calculus introduced by Coecke and Duncan is a graphical formal language for quantum reasoning based on the complementarity of observables. I’ll introduce this category-based diagrammatic calculus, give some examples, and focus on the question of completeness of the language for quantum mechanics. The language is complete if for any two diagrams representing the same quantum evolution, one can be transformed into the other using the rules of the ZX-calculus. The language was known to be complete for non universal fragments of quantum mechanics, and incomplete in general. I will present the first complete axiomatisation of the ZX-calculus for a universal fragment of quantum mechanics. Guido Bellomo (Universidad de Buenos Aires) – Quantum entropies and lossless quantum data compression. One of the main concerns in classical and quantum information theories is the problem of encoding information by using fewest resources as possible. This task is known as data compression and it can be carried out either in a lossy or a lossless way, depending on whether the original data can be recovered with or without errors, respectively. Based on the problem of quantum data compression in a lossless way, we present here an operational interpretation for the family of quantum Rényi entropies. In order to do this, we appeal to a very general quantum encoding scheme that satisfies a quantum version of the Kraft-McMillan inequality. Then, in the standard situation, where one is intended to minimize the usual average length of the quantum codewords, we recover the known results, namely that the von Neumann entropy of the source bounds the average length of the optimal codes. Otherwise, we show that by invoking an exponential average length, related to an exponential penalization over large codewords, the quantum Rényi entropies arise as the natural quantities relating the optimal encoding schemes with the source description, playing an analogous role to that of von Neumann entropy. Delia Kesner (Université Paris Diderot) is visiting the Depto de Computación (FCEyN, UBA) from 4 – 14 May 2017. The “RAICES” award acknowledges argentine scientists that reside overseas and that have invested extensive and sustained efforts in fostering Argentina’s scientific capabilities through collaborative efforts. Further details shall be supplied shortly. 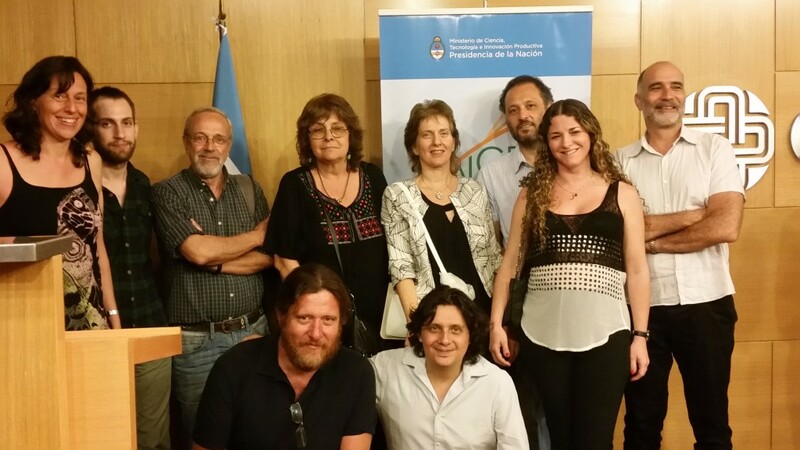 Under the STIC-AmSud project FoQCoSS, a workshop with presentations by its members will be held on December 5th and 6th in Buenos Aires (Argentina) at the campus of the Universidad Nacional de Quilmes. At the bottom of this email, you will find the program. The abstracts and further information can be found in the webpage of the event. Pablo Barenbaum visits IRIF (Université Paris Diderot) to collaborate with Delia Kesner. He will be visiting from 3 October to 3 November, 2016. Verónica Becher visits IRIF (Université Paris Diderot) from October 28 to November 12, 2016. She will collaborate with Olivier Carton and Serge Grigorieff on randomness and automata. Nicolás Álvarez will be visiting IRIF (Université Paris Diderot) from October 4th until November 29th to work with Olivier Carton.